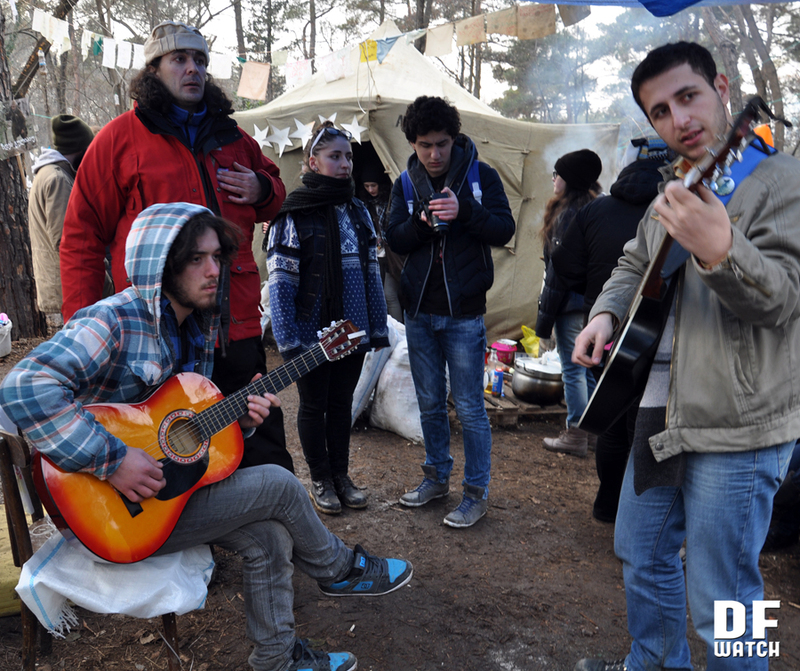 TBILISI, DFWatch–For the last two weeks, environment activists have been standing watch day and night in Vake Park in Tbilisi, to prevent the construction of a new hotel. The hotel will be built where an old restaurant called Budapest is located. It has been private property since 1994, but it is years since the restaurant was functioning. The company Tiflis Development purchased it for 2.7 million lari and planned to invest 22 million lari to build a new hotel that will take up 1300 square meters, including parking space. Environmental activists and others who are against the construction of the hotel, claim that having a new hotel in the park will cause car traffic inside Vake Park. The investor company claims there won’t be many cars because the clients of the future hotel will be mostly foreigners, who won’t bring their own cars to Tbilisi. The new hotel will have a hundred rooms. Those who are opposed to constructing the hotel claim Tbilisi is a polluted city with very few parks and the hotel could have been built somewhere else than in a park, which will necessitate the cutting down of trees. The environment minister earlier said she agrees with those who say there shouldn’t be built hotels in parks. Parks should be protected and developed. Members of the organization Guerrilla Gardening Tbilisi two weeks ago started standing guard in the part, working shifts with supporters at the fenced area where the hotel will be built. They have organized camps in front of the fences and stay there day and night to prevent construction work from starting. Some people come and stay for a couple of hours, others spend days in the park. On Sunday, hundreds of people again came to express their opposition to the plans by spending a day in the park and participating in different activities. There were hammocks in the trees. Some offered participants sandwiches and hot tea in the cold day. Children drew pictures. A very popular man among children again brought his equipment to make large soup balloons and entertain everyone. DJs and singers played music with acoustic guitars. Some people suggested free hugs or kisses, some free photos. In the camp for people who are standing guard, hot popcorn was being prepared, while others warmed their hands on a campfire. A free market was organized in the park. 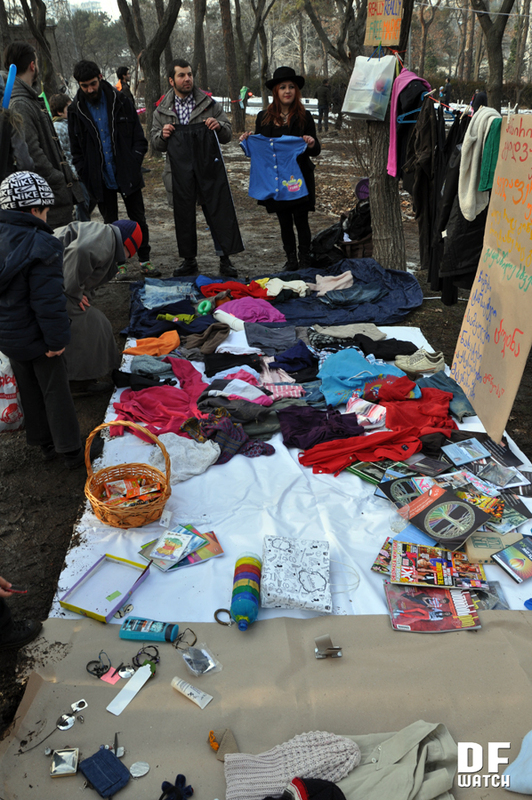 People brought different stuff like clothes, toys, jewelry which they didn’t need and took what they wanted for free. The goal of this form of rally is to show what function the park has and that it is no place to build a hotel. The best solution, some suggest, is that Tbilisi City Hall allocates a different space for the company to build Budapest Hotel.